today Microsoft came back with a good answer. The network support team is aware of that error and will bring up a hotfix and kb article in September. It will be published under ID 2634907. Nice one! Many thanks Microsoft! Today we where asked to have a view on some servers where the network performance is really poor. 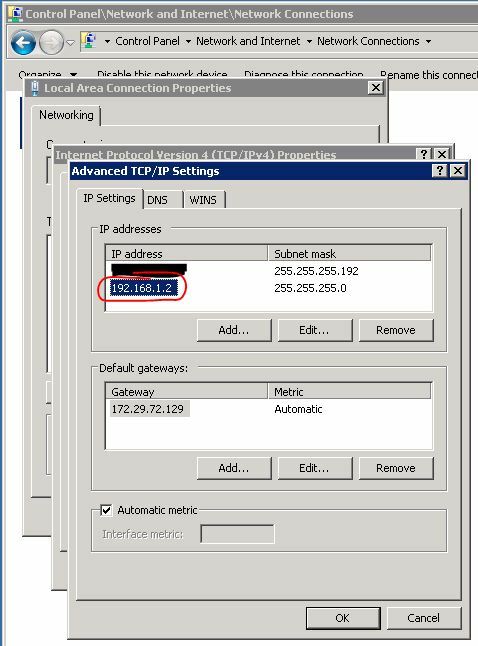 All servers with this issue are placed in branches using 4mbit MPLS connection. The network perfomance was round about 4 – 8 KB/s. Supected where 200 – 250 KB/s. Also the poor perfomance was shown only using TCP/IP. On UDP/IP the transfer rate was ok. But nothing changed the poor performance. And yes, the servers with the issue are all on Server 2008 R2 Standard Edition (RTM or SP1) and have 48GB of RAM. We removed 16GB of RAM form a server and the traffic was fast. After that we decided to ask Microsoft about that “Feature”. I will post a answer as soon as we have an answer. At @teched they spoke about some nice features in the upcoming service pack of SCCM 2012. These features are things like Linux and Mac management, sending emails on error or pin support for bitlocker. But my personal favorite is the, that there will be a powershell provider for SCCM. I can’t wait to get the wmi scripts gone. So, hopefully SP1 will come soon! We have released a new version of our bitlocker pin tool. The tool is a compiled version of the bitlocker WMI methods to get a bitlocker startup pin set by a user. This version is asking for admin credentials if UAC is enabled. Also we have started a new discussion for “Feature Request”. If you have any suggestion or wish you can enter it here. The Operations Manager Server cannot process the install/uninstall request for computer IAUSYDIN0004.network.zz due to failure of operating system version verification. Error Description: The network path was not found. 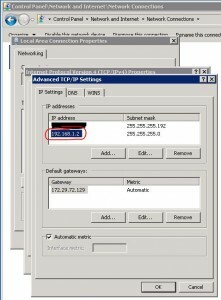 Sure, there is a blog from Kevin Holeman with error-numbers (http://blogs.technet.com/b/kevinholman/archive/2009/01/27/console-based-agent-deployment-troubleshooting-table.aspx). But the error didn’t match with ours. In our case, the firewall was turned off. Also we could remotely manage the server. And we where able to connect throug RDP. And the default action account had enought rights. So, we did a second look at DNS and saw, that there was a second, a private, IP was registered. 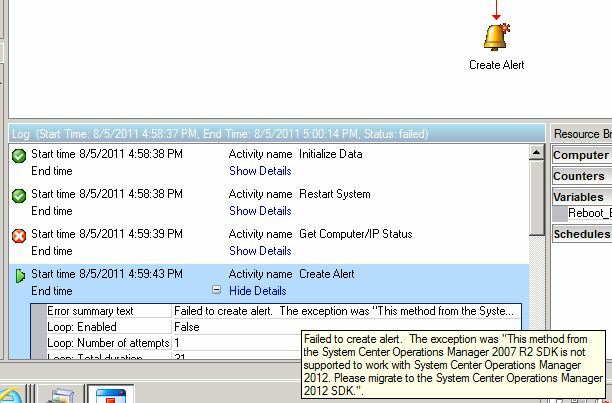 In the upcomming version of System Center Operations Manager, SCOM 2012 Beta, the single point failure is removed. There is not more Root Management Server. All management servers are equal to each other. There is still a RMS, called RMS – Emulator. If you can think of the old days of NT4, and the concept of PDC and BDC, SCOM was working the same way till 2012. Now it is more than Active Directory. The PDC is avaliable for older systems and some special things, called PDC-Emulator. So the SCOM Team did it the same way. They decided to bring the RMS back as emulated version to keep the backward compatibility. Management packs that rely on the RMS role, for example the exchange 2010 one, can be used without any restrictions. Also it is shown in the windows computer view, who has the role of RMS-E at the moment. 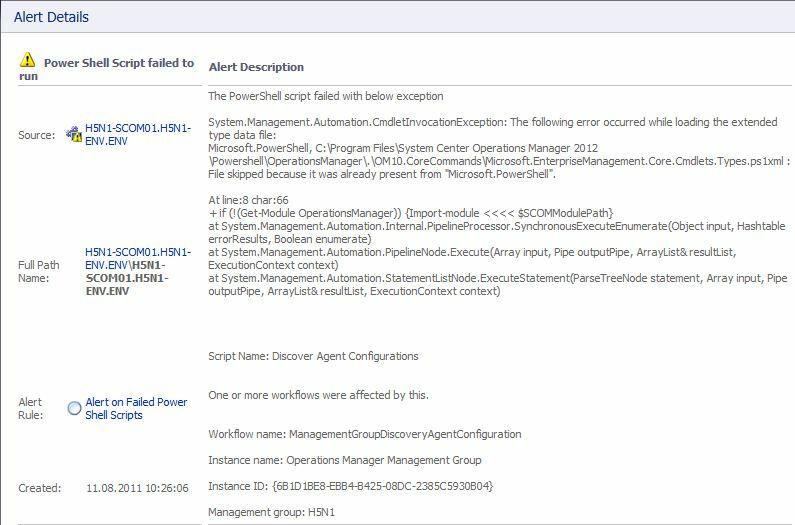 As part of this management pack, there are three discoveries that failed running its Powershell script. So we extracted one of this scripts and found, that the error was trown by $mp.GetDisplayString($lang) while $lang is filled by the get-culture commandlet. So we changed the cultur of all system accounts to en-US and the error was gone. Hopefully this error get fixed in the future being independend from the language, like the powershell already tries to be. So only the if() case need to have a executionpreference set to continue for fixing the error permanantly. A bug is reportet at connect.microsoft.com. A requirement for installation for System Center Orchestrator 2012 Beta is to have the right collation in SQL server. As SCOM, SCO also needs the SQL_Latin1_General_CP1_CI_AS for its databases. We where faced with an error in the Send Email Activity, caused by wrong collation. As Microsoft told us, there is a bug submitted to check for right collation at installation time. We actually force SQL_Latin1_General_CP1_CI_AS as we write our schema entries (as does SCOM) but having the alternate collation would have some impact in terms of temp table usage and such. I have submitted a bug previously to include a prerequisite check requiring the SQL Server to be installed using SQL_Latin1_General_CP1_CI_AS so I will check on that bug to make sure it is in fact being included in RC/RTM. This was a bug we where facing in the actual installation of System Center Orchestrator 2012 beta. The build in activity to send emails from within a runbook didn’t store its settings. The error was caused by a wrong collation. The sql server 2008 R2 was set up with SQL_Latin1_General as collation. As a requirement, System Center Orchestrator needs SQL_Latin1_General_CP1_CI_AS as collation. So we had to reinstall the sql server with the correct setting and everything was correct. The Integration Pack for System Center Operations Manager, released for Opalis 6.3 but also avaliable for System Center Orchestrator 2012 Beta does not work with System Center Operations Manager 2012 Beta. It’s caused by a change inside the SDK. So, I have to create my own activities / powershell scripts for creation of alert or setting maintainance in SCOM 2012 Beta.